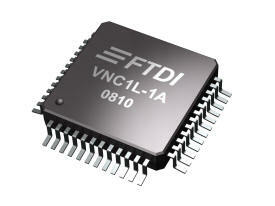 The VNC1L is the first generation device of the FTDI Vinculum family of USB Host / Slave Controller ICs, which are designed to deliver USB Host level interfacing capabilities to embedded applications. The VNC1L features two independent USB Host / Slave ports with an inbuilt 8/32-bit MCU processing core with 4KBytes of RAM program memory and 64KBytes of embedded Flash memory for firmware storage. The VNC1L supports UART, SPI slave and 8-bit parallel FIFO interfaces to enable communication with external processing devices. Further the two USB Ports on the VNC1L can be individually configured by firmware as Host or Slave ports. VNC1L can be programmed with FTDI’s in-house developed firmwares which supports a range of common USB device classes, providing a cost effective, complete, ready-to-use USB interfacing solution. Users do not need to license any USB software stacks or develop USB drivers, indeed no knowledge of USB is required to use these devices. VNC1L is ideal for implementing USB interfacing within existing applications which do not already have USB, example applications include adding USB Flash drive connectivity to a wide range of consumer and industrial products. Supplied with FTDI field upgradeable firmware supporting a range of common USB class devices. Designed to enable USB connectivity within a range of consumer and industrial applications.